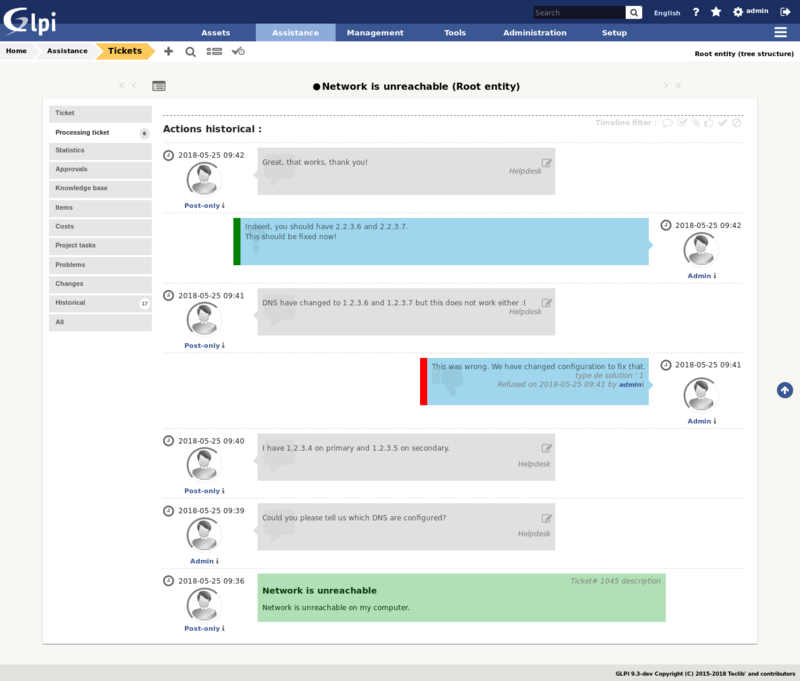 The new GLPI 9.3 ITSM software version is out, discover the new features! The main addition of this new GLPI version is the datacenter mode. Two new graphical views appears and allow to drag & drop the racks in rooms, and items in racks. and for rack view, front and rear pictures. For the Rack plugin users, we provide an optional migration script. It’s available in scripts/migrations folder of archive. The locations now include a widget to place a marker on an openstreetmap view (and so facilitate latitude and longitude definition). To consume these geographical data, from an inventory items list, a new icon is available to display a map view. GLPI 9.3 ITSM software now supports on its login page, the selection of user login source. Thus, the same login can be present on several authentication sources (same login on two different LDAP directories for example). By default, if only one source is available (Internal GLPI DB), the dropdown list remains hidden. On Historical tab of GLPI items now appears controls for filtering the displayed rows. New GLPI installations will now stored on MySQL InnoDB engine. This will mainly prevent locks on the entire tables during expensive queries and no longer block the GLPI interface for other users (the initiator of the query will always be while the execution). The existing instances will remain by default on the MyISAM engine. We can’t perform the migration with the classic update script. This is a lengthy operation depending on the size of the database and server performances. For reasonably sized GLPI instances (glpi_logs table < 1Go), we provide an optional script scripts/innodb_migration.php in the archive to allow you to apply this change. For large GLPI instances (glpi_logs table > 1Go), the script can be very long, you should prefer an external tool like Percona, pt-online-schema-change. Always be sure to make a backup before these interventions! We’re launching a new website for the GLPI Network distribution. find a partner to help you integrate GLPI in your IT. The purgelogs plugin is now part of the GLPI core. A new keyboard shortcut [Ctrl+Enter] in textareas to submit forms has been added. Network equipments and printers can now embed disks. Print support is now better. Multiple inventory items in licenses. The CAS library is now an external dependency (its license conflicts with GLPI one). It will be necessary to install the package of your distribution ([yum|apt] install php-cas). The demo website has been reviewed. It’s now filled with coherent data and is reset regularly. Download the new GLPI 9.3 version !